It has always been a dream of mine to attend a ward party without ever having to get out of my car. Last night we (the activities committee) attempted to make that dream come true for the good people of the Grandview 4th ward. "Last night?" you ask. Yes. Last night during the rain and the wind we had a Trunk or Treat Party in our church parking lot from 5-6pm during a brief (50 minutes) cessation of rain which I like to attribute to my incredible faith. We set up in the rain; We took down in the rain. But from 5pm to 6pm when people pulled into the parking lot and were greeted by our bishop with boxed dinners passed through their open windows, the weather accommodated. Dreams can come true, friends--Blissful, sloppy-joe, chips, sliced apples and caramel-dipped utensil-less dreams with a can of cold(ish) rootbeer on the side. 150 people were served [a dream] in a Styrofoam box last night. InNOut + the Gospel + Halloween? I can't even answer--I'm too choked up. Amen. After you get your dinner you pop your trunk, see, and you trick or treat from trunk to trunk. Of course you have to dress up, since it's Halloween. I had some stuff around the house that we threw together. Halloween is fun, ya'll. Afterwards Sam asked me if I was a "pothead." I was indignant. "Of course not!'" My only regrets about last night are the Unforgivable Curses I used on a few kids dressed as Dementors. They're just kids, after all. Thank you Kacy. Thank you for loving halloween so much and sharing it with the ward! My girls had a blast and didn't even care about the weather. Your car was BY FAR their favorite. Halloween is my favorite holliday but dropped the ball on my costume this year. Don't worry though. I already know what we are all going to be next year, and it will NOT dissapoint! Sorry about the rain. Stupid weather. Hmm - rain in October? Wait, you're talking about Utah!! Sounds like you were incredibly resourceful though. (I didn't go to the ward Halloween party this year - but I would have if you'd been in charge!!) Love the costumes too. Trunk or Treat strikes me as a curious tradition. How does it work... if you don't get a treat, then they throw you in the trunk? The vagueness of such an either/or proposition is a little frightening, for sure. So it's possibly being confined to the inside of a trunk, otherwise you're lucky enough to score a treat. How many people tend to get trunked at these events, by the way? The church in Utah is such a curiosity to me. It seems as if we are of the same faith, and yet it's sooo different. Boxed dinners? I'm beginning to think you guys have a WAY bigger budget than we do. We get three activities a year: a crap version of trunk or treat, a Christmas dinner, and a crap chili cook-off in the spring. I must try this Utah Mormon thing. We put dinner in a box because my friend had a thousand Styrofoam boxes left over from something she did for her school. I really wish Utah wards had bigger budgets for parties than other wards but, unfortunately, we don't. I am inspired. That is really taking an ordinary idea (trunk-er-treat) and raising the bar. Genius! You get dinner for your kids, you get candy, you can stay in your car if you want and it's socially acceptable. What could be a better activity!? And you did it all on a tiny budget (esp. considering how many people you fed)! Kacy, I thought the boxed dinners, drive through style, was genious. Miguel and I both just looked at each other and smiled. We ate all of our kids food. Just kidding, well mostly. I like the comment about getting thrown in the trunk. We should try that sometime. Oh and your treats were super clever. If only my kids knew who Hairy Potter was. Nice job! Oh boy. Rereading my comment I think it sounded critical. That's not what I intended and proves again I shouldn't type in a hurry. I'm sorry, I stink. What I MEANT to say before I crapped out is that you guys seem to be more creative. And that's awesome. I will tell you one big difference where we live. Halloween is HOT (And I mean temp not anything else). Those little furry costumes end up on the dollar rack. I really like your blog...it makes me laugh which is good since I am usually reading it while I am scraping oatmeal out of my hair from my kids or something glamorous like that. 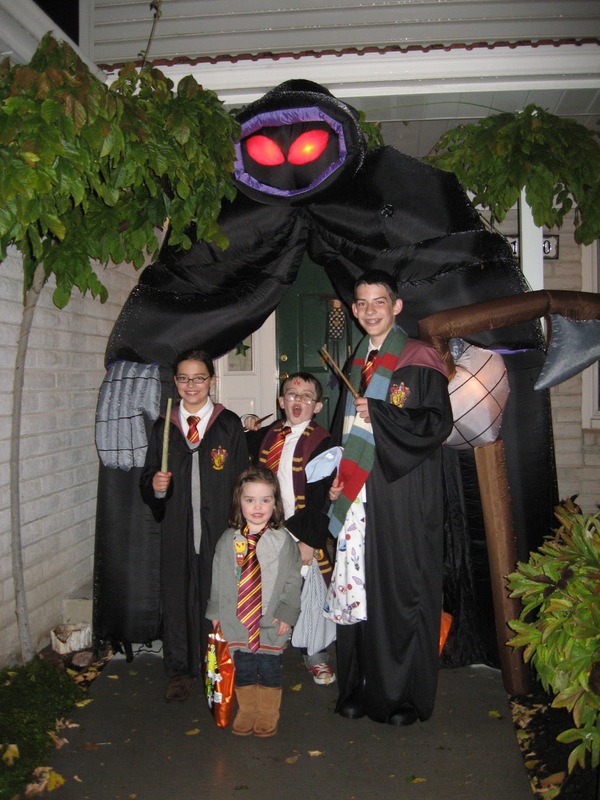 I saw a lot of Harry Potters out there on Halloween. But I must admit, I think your brood might be some of the cutest! I LOOOVE the boxed dinner idea! I was in charge of the trunk-or-treat/carnival this year, which I handily delegated to the YW because they love doing it, but I insisted on a real food table for the first time and it was a big hit (just veggie trays, crackers, chips-n-chili dip, etc, all potluck). But dinner woudl be even BETTER! I wanted to address the comment about the budget, etc. above. I would like Amy to know that I am an Activities Chairperson with NO COMMITTEE and NO BUDGET (in a ward that is like 40 miles by 30 miles in dimension, which makes me a wizard, right? wrong!). We have 4-6 activities each year and I work with a different organization on the ward council to organize and budget each one. Everything is either donated ("pot-luck" style) or comes from that organization's budget (which is why I had the YW help me on the Back-to School Family Sock Hop AND the Halloween Carnival because they like to make decorations AND they have mad cash). It's pretty touching to see the organizations kind of compete to make their activity awesome--the High Priests were asked to provide the meat for the evening meal at the Ward Campout and they went all out, using most of their bidget and lots of donations to provide an amazing BBQ for the ward). It's important for your ward family to understand that they can't show up and be entertained without contributing in some way (well, maybe unless they're in Kacy's ward with her infinite font of good ideas and inspiration). Hope that helps. Kacy, I loved your family's costumes. You inspire me to stop being such a Halloween scrooge. 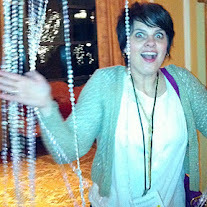 Also, please tell the blogher people to send me my prize before black friday!! !